Technology has advanced (somehow…who builds these cars?) to the point where new rookie racers are optimized for high percentage wins (then again, if antagonist Jackson Storm (Armie Hammer) is the next big thing, wouldn’t all the new cars optimize to the same level of racing, thus making all races even again? And if McQueen can be given those advancements as well, what exactly is stopping him from being faster? How does any of this work? I get that it is a kid’s film and the questions aren’t necessary to engage with the film on that level, but still!). McQueen must battle his age and a new form of racing that clashes with his tried-and-true methods in order to face his new threat. Along the way he finds help in the way of a young trainer (Cristela Alonzo) and an old hand at the sport (Chris Cooper). Cars 3, like all Pixar films, comes with a vibrant animated display. And its set pieces, at times, dazzle. The way the film handles the racetrack makes it feel like a live-action race. The energy on the track, however, is not always found off of it. The story has enough meat on its bones to satisfy the bar of children’s entertainment, but the film does not pace for a child’s attention span. The problem isn’t caused by the voice acting. Across the board, there is charisma in the richly-balanced vocals. Additions like Hammer and Nathan Fillion, who plays a sleazy-yet-smooth-talking sponsor, are great, while not in much of the film. Holding much more screentime, and making good use of it, is Alonzo as the one-time racer turned trainer car. Her vocal energy is what keeps many scenes alive. 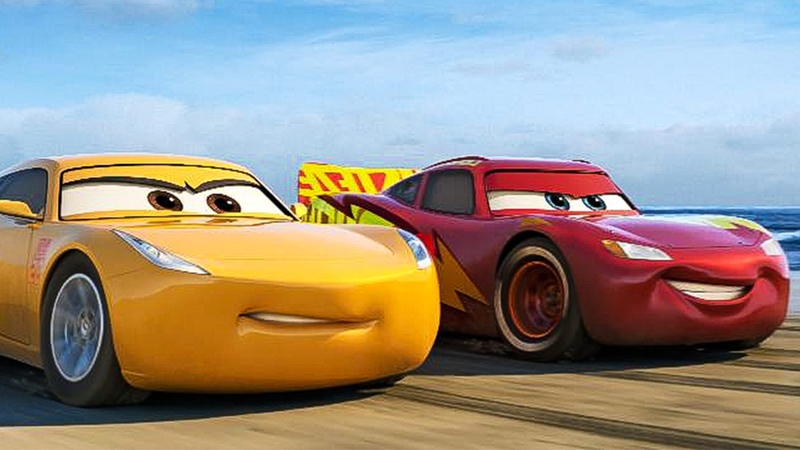 The narrative of Cars 3 is simple, but by no means does that make it lacking. It is most akin to a Rocky film. The formula is much the same. The setup introduces the hero in McQueen (and later in Alonzo’s Cruz Ramirez) and the worthy adversary in Jackson Storm. The development involves training and montages. The complicating action involves a moment of weakness before the climax: the final big event. The cars even have a training montage on the beach a la Rocky III. Visually, the film is sleek and well-directed. Narratively, the film follows a known formula to a fairly satisfying end. Even smaller technical details like backgrounds and sound design are beautifully composed. So what is at fault in this middling Pixar feature? It’s the humor. The dialogue writing in this film lacks the maturity of the upper echelon Pixar films. Characters kick out one-liners to a silent room. Car-based puns dominate the soundtrack. Occasional moments of situational humor work well, but these come off as exceptions more than anything else. Pixar holds this mantle in animation as something with more prestige than mere children’s affair. Other studios like Illumination and Big Sky are peanuts in comparison to the name and quality output of Pixar. Through this lens, Cars 3 is just as underwhelming as its predecessors. Through the wider lens of animated films for children, it fares quite better. Your choice of lens might color your experience. I liked it a bit better, and thought it had a lot of heart. I certainly appreciate your opinions though. New listener/reader to the Cinefiles, but I love the content. Enjoyed this weeks look at “Some Like It Hot” as well. Was listening while working on my blog tonight!! Thanks for all the hard work!